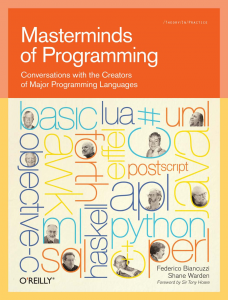 My wife gave me a real geek book for Christmas: Masterminds of Programming by two guys named Federico Biancuzzi and Shane Warden. In it they interview the creators of 17 well-known or historically important programming languages. The book was a very good read, partly because not all the questions were about the languages themselves. The interviewers seemed very knowledgeable, and were able to spring-board from discussing the details of a language to talking about other software concepts that were important to its creator. Like software engineering practices, computer science education, software bloat, debugging, etc. The languages that everyone’s heard of and used are of course in there: C++, Java, C#, Python, Objective-C, Perl, and BASIC. There are a few missing — for example, the Japanese creator of Ruby didn’t feel comfortable being interviewed in English, and the publishers considered translation too expensive. But what I really liked were interviews about some of the domain-specific languages, such as SQL, AWK, and PostScript. As well as some of the languages that were further off the beaten track, like APL, Haskell, ML, Eiffel, Lua, and Forth. The one thing I didn’t go for was the 60 pages with the UML folks. That could have been cut, or at least condensed — half of it (somewhat ironically) was them talking about how UML had gotten too big. If you’re a programmer, definitely go and buy the book (the authors paid me 0x0000 to say that). But in the meantime, below are a few more specific notes and quotes from the individual interviews. This review got rather long. From here on, it’s less of a real review, and more my “quotes and notes” on the individual chapters. I hope you’ll find it interesting, but for best results, click to go to the languages you’re interested in: C++, Python, APL, Forth, BASIC, AWK, Lua, Haskell, ML, SQL, Objective-C, Java, C#, UML, Perl, PostScript, Eiffel. C++ might be one of the least exciting languages on the planet, but the interview wasn’t too bad. I knew RAII was big in C++, and Stroustrup plugged it two or three times in this fairly short interview. Another thing I found interesting was his comment that “C++ is not and was never meant to be just an object-oriented programming language … the idea was and is to support multiple programming styles”. Stroustrup’s very big on generic programming with templates, and he badgered Java and C# for adding generics so late in their respective games. He does note that “the successes at community building around C++ have been too few and too limited, given the size of the community … why hasn’t there been a central repository for C++ libraries since 1986 or so?” A very good thought for budding language designers today. A PyPI or a CPAN for C++ would have been a very good idea. As usual, though, he sees C++ a little too much as the solution for everything (for example, “I have never seen a program that could be written better in C than in C++”). I think in the long run this works against him. One thing Python’s creator talks about is how folks are always asking to add new features to the languages, but to avoid it becoming a huge hodge-podge, you’ve got to do an awful lot of pushing back. “Telling people you can already do that and here is how is a first line of defense,” he says, going on to describe stages two, three, and four before he considers a feature worth including into the core. In fact, this is something that came up many times in the book. To keep things sane and simple, you’ve got to stick to your vision, and say no a lot. After just reading Stroustrup’s fairly involved approach to testing, Guido’s approach seemed almost primitive — though much more in line with Python’s philosophy, I think: “When writing your basic pure algorithmic code, unit tests are usually great, but when writing code that is highly interactive or interfaces to legacy APIs, I often end up doing a lot of manual testing, assisted by command-line history in the shell or page-reload in the browser.” I know the feeling — when developing a web app, you usually don’t have the luxury of building full-fledged testing systems. Yes, Falkoff admits, it takes a while to get the hang of the notation. The weird thing is, this is in 1964, years before Unicode, and originally you had to program APL using a special keyboard. Anyway, despite that, it’s a very interesting language in that it’s array-oriented. So when parallel computing and Single Instruction, Multiple Data came along, APL folks updated their compilers, and all existing APL programs were magically faster without any tweaking. Try that with C’s semantics. Forth is a small and very nifty language that holds a special place in my heart. :-) It’s quirky and minimalistic, though, and so is it’s creator. Despite the extremism in the quotes above, there’s a lot folks could learn from Forth’s KISS approach, and a lot of good insight Moore has to share. I felt the BASIC interview wasn’t the greatest. Sometimes it seemed Kurtz didn’t really know what he was talking about, for instance this paragraph, “I found Visual Basic relatively easy to use. I doubt that anyone outside of Microsoft would define VB as an object-oriented language. As a matter of fact, True BASIC is just as much object-oriented as VB, perhaps more so. True BASIC included modules, which are collections of subroutines and data; they provide the single most important feature of OOP, namely data encapsulation.” Modules are great, but OO? What about instantiation? I guess AWK was popular a little before my (scripting) time, but it’s definitely a language with a neat little philosophy: make text processing simple and concise. The three creators are honest about some of the design trade-offs they made early on that might not have been the best. For example, there was tension between keeping AWK a text processing language, and adding more and more general-purpose programming features. There’s a lot more these three say about computer science education (being educators themselves), programming vs mathematics, and the like. But you’ll have to read the book. Speaking of concurrency, he notes that in the HOPL paper about the evolution of Lua they wrote, “We still think that no one can write correct programs in a language where a=a+1 is not deterministic.” I’ve been bitten by multi-threading woes several times, and that’s a great way to put! I really like these guys’ “keep it as simple as possible, but no simpler” philosophy. Most languages (C++, Java, C#, Python) just keep on adding features and features. But to Lua they’ve now “added if not all, most of the features we wanted.” Reminds me of Knuth’s TeX only allowing bugfixes now, and its version number converging to pi — there’s a point at which the feature set just needs to be frozen. It’s a fascinating language, and if Wikipedia is anything to go by, it’s influenced a boatload of other languages and language features. List comprehensions (and their lazy equivalent, generator expressions), which are one of my favourite features of Python, were not exactly invented by Haskell, but were certainly popularized by it. There’s a lot more in this interview (on formalism in language specification, education, etc), but again, I’m afraid you’ll have to read the book. Sorry ML, I know you came first in history, but Haskell came before you in this book, so you were much less interesting. Seriously though, although ML looks like an interesting language, this chapter didn’t grab me too much. There was a lot of discussion on formalism, models, and theoretical stuff (which aren’t really my cup of tea). One often forgets how old SQL is: almost 40 years now. But still incredibly useful, and — despite the NoSQL people — used by most large-scale websites as well as much desktop and enterprise software. So the interview’s discussion of the history of SQL was a good read. One of the interesting things was they wanted SQL to be used by users, not just developers. “Computer, query this and that table for X, Y, and Z please.” That didn’t quite work out, of course, and SQL is really only used by developers (and with ORMs and suchlike, much of that is not hand-coded). But it was a laudable goal. The other interesting point was the reasons they wanted SQL to be declarative, rather than procedural. One of the main reasons was optimizability: “If the user tells the system in detailed steps what algorithm to use to process a query, the the optimizer has no flexibility to make changes, like choosing an alternative access path or choosing a better join order. A declarative language is much more optimizer-friendly than a lower-level procedural language.” Many of the other database query languages of the day were more procedural, and nobody’s heard of them today. When I started writing Oyster.com’s iPad app, I of course had to learn Objective-C. At first (like most developers) I was put off by [all [the [square brackets]]] and the longNamesThatTryToDocumentThemselves. But after you get into it, you realize that’s just syntax and style, and the core of Objective-C is actually quite elegant — adding Smalltalk-style OO to C in a low-impact way. Unfortunately for me, the rest of the interview was fairly boring, as Brad is interested in all the things I’m not — putting together large business systems with SOA, JBI, SCA, and other TLAs. I’m sure there are real problems those things are trying to solve, but the higher and higher levels of abstraction just put me to sleep. Like the C++ interview, the Java interview was a lot more interesting than the language is. And, interestingly, he has almost opposite views on documentation to Roberto Ierosalimschy from Lua: “The more, the better.” That’s a bit of a stretch — small is beautiful, and there’s a reason people like the conciseness of K&R. Gosling may be right that C# is very similar to (and something of a copy of) Java, but it’s also a much cleaner language in many ways. Different enough to be a separate language? I don’t know, but now C# and Java have diverged enough to consider them quite separately. Besides, all languages are influenced by existing languages to a lesser or greater extent, so why fuss? In any case, Anders was the guy behind the Turbo Pascal compiler, which was a really fast IDE and compiler back in the 1980’s. That alone makes him worth listening to, in my opinion. Seriously, though, I think their critique of UML as something that had been taken over by design-by-committee made a lot of sense. A couple of them referred to something they called “Essential UML”, which is the 20% of UML that’s actually useful for developers. Ivar notes how trendy buzzwords can make old ideas seem revolutionary: “The ‘agile’ movement has reminded us that people matter first and foremost when developing software. This is not really new … in bringing these things back to focus, much is lost or obscured by new terms for old things, creating the illusion of something completely new.” In the same vein, he says that “the software industry is the most fashion-conscious industry I know of”. Too true. Grady Booch gave some good advice about reading code: “A question I often ask academics is, ‘How many of you have reading courses in software?’ I’ve had two people that have said yes. If you’re an English Lit major, you read the works of the masters. If you want to be an architect in the civil space, then you look at Vitruvius and Frank Lloyd Wright … We don’t do this in software. We don’t look at the works of the masters.” This actually made me go looking at the Lua source code, which is very tidy and wonderfully cross-referenced — really a good project to learn from. Expressiveness is more important than learnability. A language can be useful even before you have learned the whole language. There are often several good ways to say roughly the same thing. Shortcuts abound; common expressions should be shorter than uncommon expressions. Languages make use of pronouns when the topic of conversation is apparent. Healthy culture is more important than specific technology to a language’s success. It’s OK to speak with an accent as long as you can make yourself understood. My experience with Forth makes me very interested in PostScript, even though it’s a domain-specific printer control language, and wasn’t directly inspired by Forth. It’s stack-based and RPN, like Forth, but it’s also dynamically typed, has more powerful built-in data structures than Forth, and is garbage collected. One thing I wasn’t fully aware of is how closely related PostScript is to PDF. PDF is basically a “static data structure” version of PostScript — all the Turing-complete stuff like control flow and logic is removed, but the fonts, layout and measurements are done exactly the same way as PostScript. Some of the constraints they relate about implementing PostScript back in the early days are fascinating. The original LaserWriter had the “largest amount of software ever codified in a ROM” — half a megabyte. “Basically we put in the mechanism to allow us to patch around bugs, because if you had tens of thousands or hundreds of thousands of printers out there, you couldn’t afford to send out a new set of ROMs every month.” One of the methods they used for the patching was PostScript’s late binding, and its ability to redefine any operators, even things like the “add” instruction. I didn’t realize till half way through that the interviewees (creators of PostScript) were the co-founders of Adobe and are still the co-chairmen of the company. The fact that their ability extends both to technical and business … well, I guess there are quite a few software company CEOs that started as programmers, but I admire that. Weird trivia: In May 1992, Charles Geschke was approached by two men who kidnapped him at gunpoint. The long (and fascinating) story was told five years later when the Geschkes were ready to talk about it. Read it in four parts here: part one, part two, part three, and part four. Eiffel, you’re last and not least. Eiffel is quite different from Java or C#, though it influenced features in those languages. It incorporates several features that most developers (read: I) hadn’t heard of. He does have a few other slightly extreme ideas, though. Here’s his thoughts on C: “C is a reasonably good language for compilers to generate, but the idea that human beings should program in it is completely absurd.” Hmmm … I suspect I’d have a hard time using Eiffel on an MSP430 micro with 128 bytes of RAM. It appears that Eiffel has a whole ecosystem, a neat-looking IDE, company, and way of life built around it. One of the few languages I know of that’s also a successful company in its own right. It’d be like if ActiveState was called “PythonSoft” and run by Guido van Rossum. That’s all folks. I know this falls in the category of “sorry about the long letter, I didn’t have time to write a short one”. If you’ve gotten this far, congratulations! Please send me an email and I’ll let you join my fan club as member 001. Seriously though, if you have any comments, the box is right there below. Great article. I like the way you handled the various topics, and it was helpful that I see things similarly to you (e.g., ” There was a lot of discussion on formalism, models, and theoretical stuff (which aren’t really my cup of tea).”). I like building stuff and think of coding as craftsmanship. I’m thinking of picking up the book. Hey. I also enjoyed the write-up. So many personalities, old heroes. Too bad Matz didn’t make the list, though. Being a user of Ruby, for a long time I thought Guido was too arrogant, but I recently watched a video of Guido on Youtube that made me to sympathize more with him. I’m quite fond of RegEx as I learned it in Ruby. Thanks to Larry Wall for helping to make it popular. PDF/PostScript also fascinated me at some point. I even wrote a little library for generating some PDF but it didn’t make it. It’s good to learn about them some more. I’m with Anders console.writeline or similar usually does it for me. Anders was also the brain behind Borland’s Delphi. Microsoft hired him to write C# – which is very similar to Delphi. I continue use a 12 year old copy of Delphi to write Windows apps. What can I say, it works. I think that by definition, something that predates something else cannot be referred to as a clone. Eiffel is older than C# and Java. I don’t understand. How can a comment be an embedded programmer? Or did you mean “As an embedded programmer, I was fascinated…” ? Sorry, but on Reflection it threw an AmbiguousMatchException. What happened to Dijkstra – Algol 60? If it wasn’t for Dijkstra, none of the others would’ve had jobs – he was the giant on whose shoulders they all sat!! Very well done review. Thanks. @Mahakali: you’re dead right, thanks. I’ve updated the wording slightly. @VViking: ha, very nice. I called Reflection.FixAmbiguity(usecommentorsuggestion=true). @Dan: yep, unfortunately Dijkstra died in 2002. I did not read all parts of it, but I like your article very much! Very good written (of course I’m german and can say lot about this, but I understood everything – so it’s fine)!